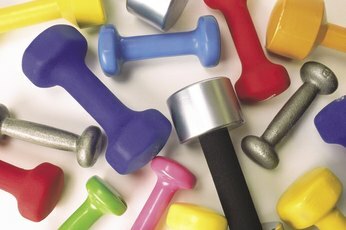 Building toned muscles is about more than just looking great in that swanky cocktail dress – proper strength-training also develops strong bones, reduces risk of injury, increases your stamina and helps control weight, according to MayoClinic.com. You don’t need to spend hours in the gym to tone your muscles properly; two to three sessions of 20 to 30 minutes of proper strength-training will have you looking and feeling fabulous. Complete a five- to 15-minute warmup consisting of aerobic exercise. If you’re at the gym, hop on the treadmill or elliptical to get your heart pumping; at home, do jumping jacks, jog in place or jump rope. A solid warmup prepares your body for exercise and warms your muscles. Once your muscles feel warm, start your muscle-toning program. Choose your weights. While the size of weight will vary depending on your fitness level, select a heaviness that you can no longer lift with proper form after the 12th repetition. Once you’ve gotten into the swing of things and you can lift a weight 15 times easily, it’s time to bump it up to the next level. Engage in compound movements. Free weights have an advantage over machine weights because they allow you to incorporate compound movements in your workout. These exercises move and stress more than one joint at a time, making your toning session more efficient and more effective. Examples of compound movements include rows and lunges. You can also combine two movements to create your own compound exercise, such as rotating your torso while doing a shoulder press. Work your core muscles, doing exercises such as planks, crunches and twists. Your core muscles include your hips, abdominals and back, all of which support your body and make everyday activities that include flexing, extending and rotating your body much easier. Focus on using proper form when toning your muscles to reduce risk of injury. When standing, align your legs under your shoulders while keeping your knees soft. If doing a seated exercise, keep your spine in aligning with your hips and head with your feet flat on the floor. Lift the weight in a smooth and controlled manner, exhaling when you push or pull the weight. Cool down to let your body slowly relax. Take five to 15 minutes to complete another round of moderate aerobic activity, and follow it up by stretching all major muscle groups. Allow a day of rest in between each session to let your muscles recover. You can alternate days of full-body weights and rest, or break your workouts into muscle groups, allowing one set of muscles to recover while you work another set. If you’ve never lifted weights before, ask a personal trainer or physical therapist to show you proper technique. Consult your health care provider before beginning a new exercise routine.